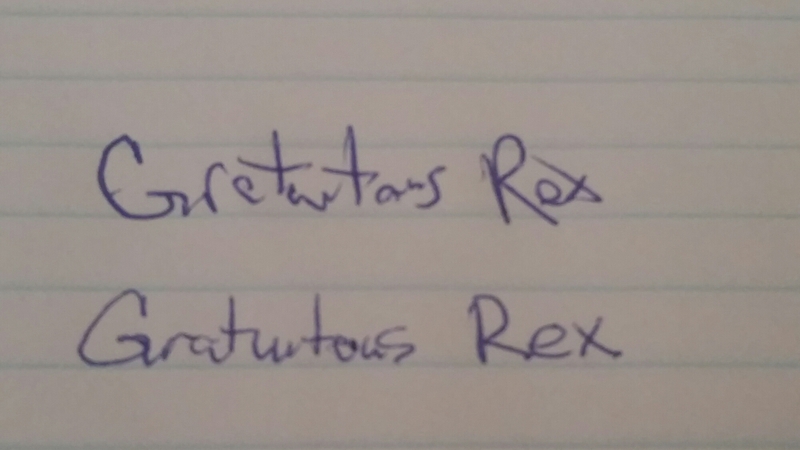 So I’m not quite ambidextrous. My stronger arm is my right. I throw righty, swing a golf club righty… I do most strength-related things righty. However, I always wrote lefty. I don’t know why but that’s how it’s been. And of course, I had all of the handwriting problems lefties have, like getting ink smeared on my hand and binder rings getting in the way. However, 8 years ago something happened and I don’t know what, but my left hand started not working 100%. I lost finger strength like fastening buttons, holding small objects and even typing is difficult. So much so that i now only type with my right hand. The left hand actually feels thicker around the pads at the base of the fingers. There’s no numbness or tingling, which are usually the telltale signs of Carpal Tunnel Syndrome. I’ve had it looked at by neurologists. They’ve done the uncomfortable test for CTS that involves sticking needles in my arm and moving them around. Nothing. When they hear that I’ve had a huge brain injury as a child, they diagnose me with Dystonia, which, after reading, is NOT the case. Plus, there’s no cure or good treatment for it. There’s so much discomfort and stiffness in my arm at times, yet weakness in the fine finger gripping. Ugh. With very little practice, my right hand handwriting became very neat and legible. I only use my left for my signature now. Welcome to the fun world of being me. Just the very next day, via Facebook Memories, I noticed that 5 years ago I also wrote about my handwriting switchover.